Hockey Canada unveiled their coaching staff for 2014 Sochi Winter Olympics on Monday. Mike Babcock will return as the head coach after leading the team to the Gold Medal at the 2010 Olympics in Vancouver. Assisting him will be Lindy Ruff, Ken Hitchcock and Claude Julien who all bring many years of NHL and International experience to the table. “I am extremely proud to represent my country and coach Team Canada,” Babcock said. “To have had the opportunity to share the Olympics with family, friends and all Canadians in Vancouver was something very special. Babcock brings plenty of experience to the table. Not only is he the only coach in the Triple Goal Club (Olympic Gold, World Championship Goal and Stanley Cup) but he has also over 787 NHL games to his credit, with 445 of those being wins. He has won at every level, including at the Canadian Interuniversity Sport (CIS) national title with Lethbridge in 1994, as well as with Team Canada at the World Juniors U-20 team in 1997. Ruff and Hitchcock are also returning from Vancouver, having served as Babcock’s assistants then too. Julien is making is Olympic debut. All have had plenty of success at the NHL level, with Hitchcock and Julien both winning the Stanley Cup and Ruff having coached over 15 seasons and counting. 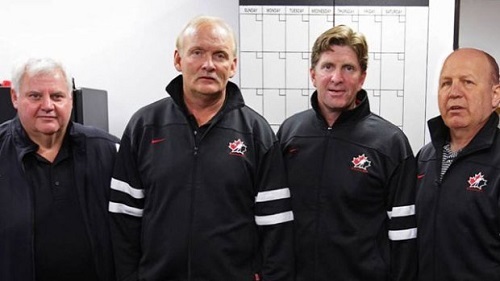 The Team Canada 2014 Sochi Olympic coaching staff, from left to right, Ken Hitchcock, Lindy Ruff, Mike Babcock and Claude Julien. Yzerman is also returning from Vancouver, once again serving as executive director. He will be joined on the management side by Doug Armstrong, Peter Chiarelli, Ken Holland, Kevin Lowe, Bob Nicholson and Brad Pascal. After winning the Gold on home soil back in 2010, the management team and coaching staff will face some tough challenges as they try to repeat as champions. But Babcock is ready for the challenge. Yzerman also unveiled the 47 man roster that they invited to their orientation camp in late August. The full list of players can be found here. Check back to HookedonHockeyMagazine.com in the coming weeks for more on the players who could don a Canadian sweater this winter in Russia.